‘People’ food isn’t good for animals – Most of the foods that you and I eat don’t contain the correct amount of nutrition for wild animals. 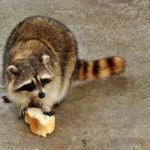 Bread and other grains are commonly given to wild critters, which can cause serious health issues over time. Wild animals lose their fear of humans – This might not seem so bad, but it’s that natural fear of humans that keeps wild animals a safe distance away from us and our homes. When we feed them, that fear goes away which can lead to animals constantly loitering around your home looking for food, and can even lead to the spread of disease in some cases. Animals become dependent on handouts – Wild animals are natural hunters and gatherers, and when we offer an easy source of food, they naturally take advantage of it. Over time it can cause them to lose their ability to hunt for themselves, hurting their ability to survive without human assistance. The animals may have too many babies – Many animals’ birth rates depend on how plentiful food is around them. Putting out food may trick them into thinking there’s more food available than there really is, causing them to give birth to more babies. If that food supply is then removed, it can cause starvation. While feeding the critters around your home might seem like a nice thing to do, it always does more harm than good. Even if you aren’t intentionally putting food out for them, make sure to feed your pets inside and keep garbage cans tightly sealed to prevent unwelcome visitors. If you have concerns about a wild animal around your home, give the experts at Critter Control a call today at 407.295.7194.